All this rubbish weather has resulted in the failure of one of my pots… Luckily I had planned to repot this into a round mica training pot for the next few years this year for development. So I think this will be done sooner rather than later. 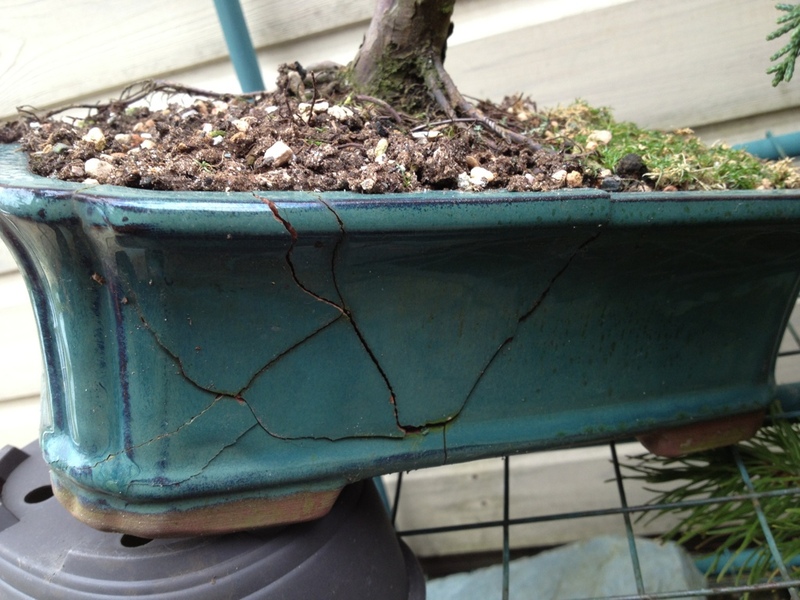 This entry was posted in My Trees and tagged Bonsai pot fail. Bookmark the permalink. Truly a tragedy! I’m nervous about my own as well. They are under about 3 feet of snow right now. Given the opportunity get the snow off your trees. Our snow turned rather heavy during the thaw!!! I tried to the other day but they seem to be frozen in a mound of snow/ice. I’m gunna have to melt it down with luke warm water.